The bridge of the Enterprise from Star Trek: The Next Generation has faced many challenges. It's been attacked by the Romulans, the Ferenghi, and even the Borg, and it's kept on sailing. Yet there's one threat that almost destroyed the bridge for good - the weather. Seems a lack of storage and preservation has left an official set of the original Enterprise bridge on the verge of destruction. But now there's a chance that we can save and even improve the real bridge, and get some cool swag along the way. It turns out the bridge reproductions have gone through a tumultuous history. You can read the full journey at Arstechnica, but here's the short version. The original bridge set was destroyed during the filming of Star Trek - Generations , but three authentic reproductions were created for display at shows like the Star Trek Experience. None of them fared very well, and one was kept outside a warehouse in Los Angeles where the elements destroyed most of the fiberglass and plexiglass structure. 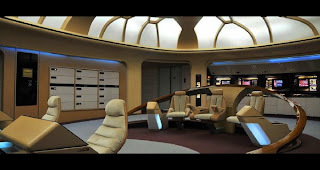 Three guys created a new foundation called The New Starship to acquire and restore the bridge. Not just restore it back to the way it was, but improve it. Turns out the reproduction wasn't that accurate, so they want to make changes to match the original set, plus put in working touchscreens. To do that, they need money, which is where we all come in. They launched an IndieGogo page to raise the $240,000 needed to do the restoration. Those who donate will get a range of stuff from a T-shirt that says "I Saved the Bridge" all the way up to a night of romance for two aboard the set to a life-size interactive replica of the Captain's chair. Click the links to check it out. I wonder how far I could go with that night of romance on the bridge. And guys, did you see that they are FINALLY making a Shannara movie? I've waited years for that to happen. Well, they do promise complete privacy until morning. There are more prizes. You can also get your name engraved on one of the computer's isolinear chips or get a handheld touchscreen designed to look like the LCARS screen. And yeah, a lot of Trek fans might have to pass on the romantic evening.